Currently "Cone Lasers" are only available as hire items. Other grades can be supplied upon request although a two to three week window is required to build and calibrate the equipment if not on the shelf. 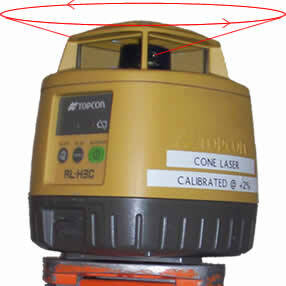 Topcon and Datum products are available for hire also, see Topcon and Datum range. Reduce engineers time on site? Remove the need for re-setting out (no pegs for plant to knock over)? Reduce labour involvement (boning in)? Keep designers and E.A. happy? Get it right the first time? Then click here to view full specification.